John Lewis is one of the most notable leaders of the American Civil Rights Movement and the current U.S. Representative for Georgia’s 5th congressional district. Right from youth, Lewis subscribed to the philosophy, which considered suffering as redemptive. He said, “We were taught not to hate, not to become bitter, but to believe in the philosophy and discipline of non-violence, in the way of peace, in the way of love, the way of forgiveness and reconciliation.” He acknowledges that he was arrested about 40 times in the 1960s and about 5 times in the Congress for protesting against South African Apartheid regime as well as violence in Sudan, and immigration policies of the United States. While Lewis was in prison, he built relationships with his guards and treated them as his fellow human beings. He did not dislike his jailers, even when he was abused. He noted that the prison gave him an opportunity to study and learn; he even conducted a few non-violence workshops in prison. He also asserted that he grew to accept the way of non-violence, the way of peace, the way of love and forgiveness, the way to be reconciled as a way of life. 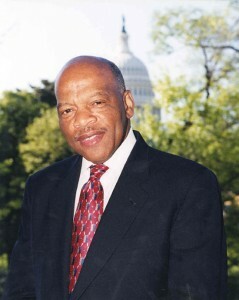 Congressman Lewis argued, “Non-violence and forgiveness is not just an idea, but it is a way of living for me.” After leaving prison, Lewis noted that there were several occasions when the people who had wronged him in the past came to say “I am one of the people that beat you and I want to apologize, will you accept my apology? I’m sorry, will you forgive me?” And he did not only forgive them, but he invited them to create a new set of relationships. Congressman Lewis has had many encounters with people who have wronged him in the past. In February 2009, Lewis recalled an encounter with the son of a man who had attacked him at a bus station on May 9, 1961 in Atlanta. This young man had been encouraging his father to seek out the people that he had wronged during the height of the movement, and it led them to Lewis’ office. Lewis remembered, “The father was a few years older than I am. In 1961, I was 21 years old and he was probably 24, maybe a little older. But they beat me and my seatmate and left us lying in a pool of blood at the Greyhound bus station.” Lewis recalled that the father, accompanied by his son, came to his office after so many years and asked “Mr. Lewis will you forgive me? Do you accept my apology?” He said, “Yes I forgive you, I accept your apology.” At this point, Lewis continued, “the man’s son started crying, he started crying and they hugged me and I hugged them both back and I started crying too, they started calling me brother and I called them brother.” The man and his son visited Lewis numerous times after that first encounter. On other occasions, when Lewis went back to places like Mississippi, Alabama, and Nashville, Tennessee, where he spent six years as a student, people welcomed him and looked upon him as a hero. At Birmingham airport, a middle-aged white man came to Lewis and said, “I want to speak to John Lewis.” Lewis responded and said, “I’m John Lewis,” and the man replied, “Mr. Lewis on behalf of all the white people of Alabama I want to apologize to you for what we did.” Lewis accepted the apology and said that he would never forget moments like that. Source: Adapted from an interview with John Lewis about his prison experience conducted by Borislava Manojlovic, December 2013. While he was a student at Fisk University in Nashville, Tennessee, Lewis began to study and learn how to seek justice through nonviolence. James Lawson taught Lewis and his fellow students both the philosophy and application of nonviolence. They read, studied, discussed, and debated the great nonviolent thinkers and leaders such as Reinhold Neibuhr, Thoreau, Mo Ti, Lao-tzu, Gandhi and others. Lewis described their training and rules as follows: “We spent the next week in daily gatherings, briefing everyone who could attend on the essentials of sitting in, on the behavior that would be demanded as they entered those downtown stores. No aggression. No retaliation. No loud conversation, no talking of any kind with anyone other than ourselves. Dress nicely. Bring books, schoolwork, letter-writing materials. Be prepared to sit for hours. Study, read, write. Don’t slouch. No napping. No getting up, except to go to the bathroom, and then be sure there is a backup to fill your seat while you’re away. Be prepared for arrest. Be prepared to be taken to jail.” (Lewis, John, and Michael D’Orso. 1998. Walking with the Wind: A Memoir of the Movement. New York, NY: Simon & Schuster: 100). Having met Congressman Lewis when I worked and studied in Washington, D.C., I can say he is one of the most carrying and intelligent individuals I have ever met. He is one of a few politicians who actually practice what he preaches. He very much so spearheaded the Civil Rights Movement, and he was not afraid to stand up for what he believed in. He has conviction, but yet is able to sit down and compromise. This is something not widely practiced in Washington today. Congressman Lewis unquestionably uses what he learned from protesting during the Civil Rights Movement to serve as an effective member of the House of Representatives. John Lewis, due to his display of forgiveness and tolerance, has often been called the “the conscience of the U.S. Congress.” Having been inspired by Dr. Martin Luther King Jr from a very young age, Lewis became involved in the Civil Rights Movement at a very pivotal time in his own life, and that has clearly shaped the man he later became. Although there was plenty of violence, disruption and general injustices taking place around him, Lewis chose peace and tolerance to fight the unfairness that was imposed upon him. And most exceptionally, despite having been beaten unfairly, and despite having been put in jail, later on in life, Lewis chose to embrace forgiveness instead of bitterness. John Lewis, a personal friend and colleague of the Rev. Dr. Martin Luther King Jr. during the civil rights era has several wonderful stories of repentance and forgiveness. On one particular occasion, in May 1961, Lewis was beaten due to attempting to enter a waiting area of a bus station in South Carolina marked “Whites Only.” A man named Elwin Wilson took part in the attack, and forty years later they met again, at Elwin’s request. It would have been completely understandable for Lewis to react negatively to the reunion. Instead, Wilson was recorded in the exchange saying, “I’m so sorry about what happened back then,” to which Lewis responded, “It’s OK. I forgive you,” followed by a hug. This is a remarkable display of forgiveness. This interaction between Lewis and his counterpart Elwin Wilson is an example of how love and forgiveness can play out at the governance level and help heal wounds from the past. We should take this display of acceptance and forgiveness as a sign for hope in humanity’s ability to move beyond the pain caused in the past. For Lewis this notion of acceptance is not new as he experienced more than 40 arrests, and experiencing numerous attacks and injuries throughout his fight for civil rights, he has always remained an avid practitioner of nonviolence.